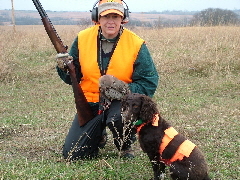 HOME TO TEXAS BOYKIN SPANIELS! We are Greg & Michelle Copeland, Roslin Copeland and Ginger Hurley. 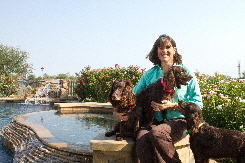 Claimed by several Boykin Spaniels, we live and work in Houston and Hempstead, Texas. We live with our Boykin family: Texas Trace Midnight in Austin, Texas Trace Kelley, Texas Trace Camille, Texas Trace Vega, Texas Trace Hunter, Texas Trace China, Texas Trace Tyler, Texas Trace Wink-and-a-Smile, and a few others from time to time. My sister, Roslin and Ginger live with Texas Trace Sunnyside, Texas Trace Destino’s Cazadora, Hollow Creek’s Texas Trace, Texas Trace Kelley Chamizal’s Treaty, Texas Trace One-in-a-Million Angels and Texas Trace Rio Grande. My older sister and her family who live in Atlanta, GA also own a couple of Boykins. Of course we are all enamored by our Boykins and we each think our special Boykin is the best and smartest dog in the world and if the truth be known, they are smarter than us. We set up Texas Trace as a kennel intently focused on improving the health of the breed, furthering it’s hunting instincts, and trying to do all the things one can do with a Boykin Spaniel – hunting, hunt test, field trial, agility, rally, obedience, therapy and conformation. Our original Boykin, Just-In (UWP GRCH Curlee’s Just-In) was a pup of HRCH UH Curlee Gurlee and HR UH Sydney of Woodbine which both have too many titles and winnings to list. Just-In was one great hunter. He was also not only a 2003 UKC TOP TEN of the Boykin Spaniel breed, he was a 2003 UKC TOP TEN TOTAL DOG – a unique title and one only three Boykins have obtained. Also, Desie, Roslin’s first boykin was one of our orginal founding boykins at Texas Trace. Please read both stories on our Remembrance page. Since the recognition of Boykin Spaniels in the AKC, Texas Trace Boykins have been extremely busy and our Boykins have accomplished many titles - most and first in Champions and Grand Champions. We breed only occasionally and we only do so in an effort to advance the breed, to further the hunting instincts of the breed and with a focus on improving the health of the breed. Generally those puppies are spoken for long in advance. We have the greatest respect for breeders who breed with a conscience. 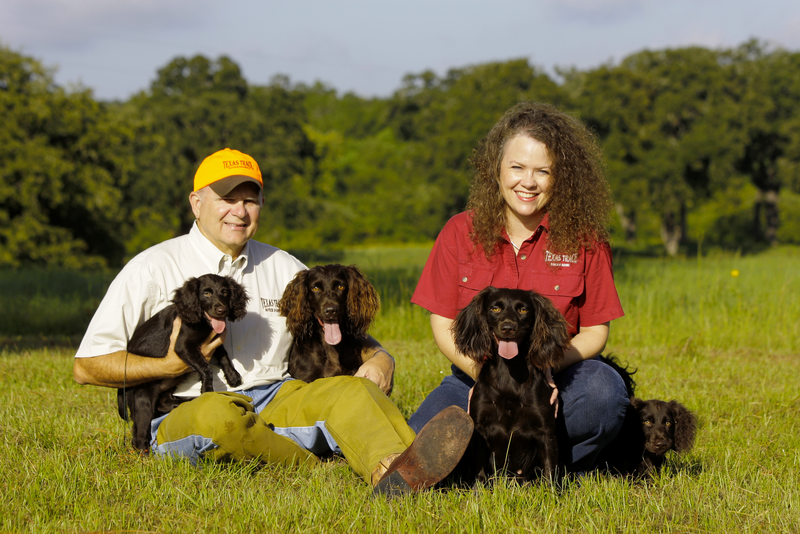 And we commend those breeders who give back to the Boykin as much as they get -- as evidenced by their kennel, their dogs, their knowledge of the breed, the standards they advocate and adhere to, their commitment to improve the health of the breed and their preservation of the hunting instincts of the Boykin Spaniel. While some breeders stand out in my mind, we admire each who continuously give of their tireless energy and who always show their love of the Boykin and devotion to our little brown friends and companions. We can only hope to give back to the breed a small portion of what the Boykin have given us. Texas Trace Boykins can be found all over the nations, please visit our location page to see if there is one near you. Please visit our Testimonial Page from many of our clients. Please visit our links page for more sites on Boykin Health, clubs and our other friends.